2016 has been a year where the exception has become the norm. HOW TO SELL CLOUD TO YOUR CEO? Next RACE AGAINST THE MACHINE – WILL YOU DO WHAT THEY TOLD YOU? The household-known innovators of this world, such as Netflix, Uber and Airbnb, have accepted the business case argument of the cloud, and just expect IT costs to be low. In essence, what they are really doing to drive value from the cloud is developing a new business model, a culture that is fast to innovate, and to respond to insight and change in the market. This needs cloud IT, but it also needs a host of other capabilities and values to derive benefit. We’re not looking for the business case beyond the IT benefits – a much stronger universal benefits case needs to be brought into the boardroom. We fear the change – a structured transformation approach will drive that change across all aspects of the business. We’re concerned it might break something or are unconvinced of the need – take a phased approach to change; use framing to drive a proposition and the multi speed IT model to make it stick, then spread it out to other areas. RACE AGAINST THE MACHINE – WILL YOU DO WHAT THEY TOLD YOU? Previous HOW TO SELL CLOUD TO YOUR CEO? Way back in history – you know, when the PC, Internet, smartphones and Pokémon Go were still unknown – IT was simply known as “automation”. CPU power enabled computers to process data and make calculations much faster than humans, hence certain activities were automated. This rendered the human equivalents of it obsolete, obviously to the dismay of the individuals involved. But processes changed roles and capabilities evolved and people moved on, using systems to support them in their new work activities. The information and communication dimensions of computers became more important, access to it became democratized and business and IT alignment took centre stage: Information Technology (IT) – and then Information and Communication Technology (ICT) – was born. Automation changes its focus, first of all – ironically, if you like – to optimizing, combining and replacing human activities that are carried out with systems in the first place (Robotic Process Automation, anyone?). The Bot effect applies machine learning and cognitive capabilities to automate communication with humans. Leveraging a flood of data, predictive analytics, rule-based systems, and Artificial Intelligence can make thousands of automated decisions and act accordingly in a split-second, arguably with a higher success rate than humans, and obviously faster. Bring it all together, and sooner or later completely autonomous systems will drive our cars, fly our planes, run our manufacturing plants, and essentially take care of any other task for which we assumed that human insight was crucial (including the presidency, but let’s not even go there for now, way too tempting). The question is not really whether these highly automated systems are qualified to do their jobs. In fact, quite soon we might need to demonstrate why we would be able to still do something ourselves, for example driving a car. The real question is: will we let them do it? What if Computer Says No and we just feel it should be Yes? What if it says Leave It To Me and we don’t really trust it do it? Do It Yourself First. Assuming you are on the IT side of things, start applying automation to your own processes first. There are many areas in the IT lifecycle that utterly qualify for this, as proven by the advent of DevOps, which heavily relies on highly automated “tool trains” to continuously build, release, run, and repeat. But also the service management dimension of IT, including helpdesk and provisioning of IT services, is an obvious candidate. Use these IT-facing initiatives as a way to become more productive and get familiar with the next generation of technologies. But even more, show your business clients first-hand how it’s done, that it its feasible, and that it delivers real results. Choose your battles. You may want to initially consider smart automation in areas that are easier to accept for humans: activities that follow relatively simple, unambiguous rules and are non-critical in terms of their business impact, for example. Then again, ultimately machine learning will prove itself most in areas that are too complex or overwhelming, or even tricky for humans; cognitive technologies may be able to deal with even the fuzziest, unclear context. Explain and engage. A crucial quality of a successful technology breakthrough is that it be properly explained to its users. When a system tells us on what metrics it has based its decision, what algorithms have been used – preferably in simple, natural language – and what confidence it has in being right (expressed through a percentage, for example), it feels more natural to transact with it. Also, providing the user with feedback mechanisms to rank the quality of the logic and improve its performance will help to create a better bond between man and machine – perhaps with the aid of machine learning. Ultimately, making the technologies applied and accessible to the business – for example through a simple but powerful self-service platform – will dramatically improve the acceptance levels. Think Augmentation. Artificial Intelligence should become Augmented Intelligence. Automation should become Augmented Automation. When technology is a seamless, natural complement to us as human beings, augmenting what we do, rather than replacing us or eating away our self-esteem, we are truly unleashing the power of the machine. When Fan Hui, one of the world’s top Go players lost to Google’s AlphaGo system (featuring the highly advanced Tensorflow artificial intelligence platform) he felt sad that even this game – long considered the final frontier with the human mind still superior – now became the domain of machines. But by examining the sometimes otherworldly moves of AlphaGo, he started to appreciate the sheer beauty of it, learning new ways himself as well and clearly improving as a player. It’s where automation becomes augmentation and we realize it is no race, after all. * Thanks to Menno van Doorn for originally using the concept of “Race Against The Machine” in a presentation. Previous RACE AGAINST THE MACHINE – WILL YOU DO WHAT THEY TOLD YOU? he Internet of Things (IOT) has the potential to fundamentally change how businesses and consumers operate, and there has been a lot said and heard about the value created by digital technologies and the implementation of IOT for operational benefit. But what might this look like in practice? Last week, we introduced an upcoming residency program aimed at imbuing a culture of innovation in the businesses of our clients. This program will select a handful of participants for an 18-month immersion program that will recode them to be executives for the digital era. I’m excited about this program because it embodies the goal of our Applied Innovation Exchanges (AIEs) Our AIEs steep clients in awareness and insights so they can create a sustainable framework for innovation within their organizations amidst ongoing digital disruption. We recently introduced the residency program at our San Francisco-based AIE during an event for media and partners. At this event, we discussed some of the many challenges clients face in a digital age where innovation is expected and, when optimally utilized, can be a catalyst for rapid and scalable impact when applied in a results-oriented manner. Two issues that frequently arose from sessions covering retail, automotive, and the rise of fintech within financial services, were keeping pace with change and incorporating a culture to scale the benefits of innovation. These issues will become increasingly relevant as the digital transformations of business accelerate the pace of change in the market and magnify their effects. During a retail session, Kevin Schaff from Twyst pointed out fully digitized brands (i.e. everything from design concept to logistics and inventory) are able to get a product to market in ten days–something that normally takes up to eight months to do. Lisa DeCarlo from Wells Fargo during a fintech panel discussion said that by turning to digitization in product development they were able to gain willing support from 90 different internal business stakeholders for a new product that launched in six months. Typically in such a large organization as Wells Fargo, it could take at least two years to launch a product and would rarely have broad awareness let alone support. Too frequently, innovation is misunderstood and underutilized. Innovation isn’t a shiny object, such as a drone or a robot – it is a skill set that needs to be understood, distributed and sustained to achieve breakaway results. Skill sets take time to develop and a commitment to nurture them. Our AIEs help our clients build up those innovation skill sets and embed them as a foundational part of their organizations. We offer up workshops to help discover innovations, devise frameworks to take advantage of them, deploy business models using the benefits of innovation; and sustain a culture of innovation. Our AIEs can act as a platform for digital transformations and offer the application of innovation as-a-service. Organizations need to harness innovations to translate them into their businesses and their results while simultaneously keeping up with the pace of change that is accelerating as more businesses go digital. We currently have 12 AIEs globally located in strategically important regions for our clients and our business, with two more set to open in 2017–one in New York City and another in Singapore. We anticipate two to four more in the coming years. Our next step in our AIE vision is the residency program, which is in the planning stages, and we have identified our first three participants who will undergo a digital transformation in our San Francisco-based AIE starting in early 2017. Silicon Valley still remains the hub of the world’s most dominant innovation “empire” – a location of a thriving innovation ecosystem where innovation centers cluster. However, as the innovation center phenomenon has continued to spread globally, a number of new empires have emerged where innovation centers are flourishing. 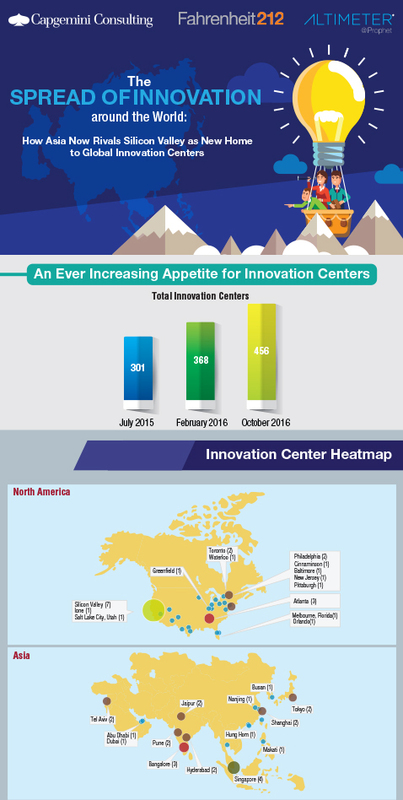 In just eight months, from March 2016 (around the time our previous research, The Rise of Innovation Empires Worldwide, was published) to October 2016, 88 new centers opened across the globe, compared to 67 between July 2015 and February 2016. The top 3 cities in Asia together added more innovation centers than Silicon Valley. Our research also finds that specialized function or technology-focused centers are in vogue. The Spread of Innovation around the World: How Asia Now Rivals Silicon Valley as New Home to Global Innovation Centers. Lanny Cohen, Group CTO at Capgemini breaks down the reasons that the Applied Innovation Exchange is making a difference to its clients.